The roster feature allows you to change the start/end times for staff members on specific dates. 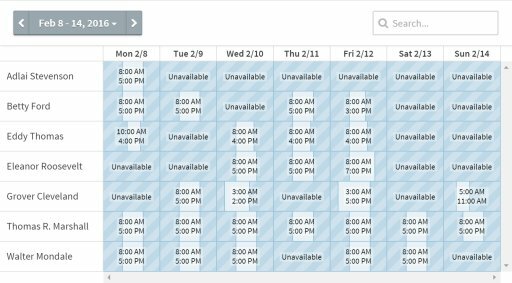 For example, an employee who is normally unavailable on Thursdays can be made available for just Thursday, February 5. 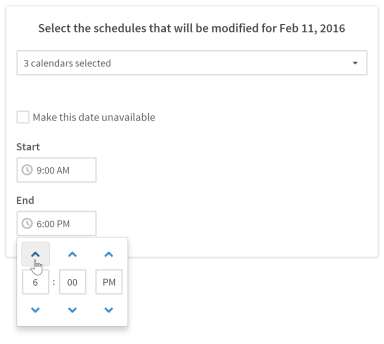 You can also modify multiple calendars at once using the multiselect dropdown. Click on the arrow next to the Calendars heading in the side nav. Then, select Manage Roster. In the window that pops up, select a date in the row for the relevant staff member. A smaller window will open. 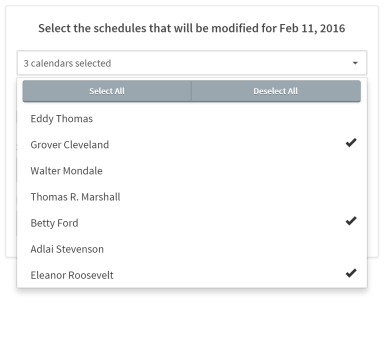 You can also select additional calendars, allowing multiple schedules to be customized at once. Choose a new start and end time, or check the "Make this date unavailable" checkbox to make the date unavailable for the selected staff member(s). Modified dates will be highlighted in yellow.